My experience with BeLiteWeight has been nothing short of life changing and quite possibly life saving. It's the most pleasant surprise I've had in a long time. When I say "surprise," I mean it was everything promised and much more. I have battled with my weight my entire life. 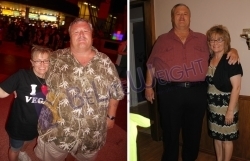 I've been on every diet, pill and fad that has ever been conceived to lose weight--I lost about 100 lbs. a couple of times, I've probably lost and regained 500 lbs. in my lifetime. About a year ago, I decided that I needed something that was permanent and worked for weight loss and I had been researching bariatric surgeries for quite some time. Every doctor and hospital that I contacted in Texas was the same thing, the first thing they wanted to know was "what kind of insurance do you have?" When I told them that my insurance had an exclusion to bariatric surgery they suddenly weren't as interested in me as they were before. Paying the full $30,000 was not an option for me. Then one day, I got on the internet and low and behold there it was, BeLiteWeight. I clicked on the website and found the solution to my problem, or had I? At that point I thought, "you know what have you got to lose Terry?" To do nothing was not an option at all. So I filled out the info form and sent it in. Then I got busy with my life and had forgot about it to be honest, but a couple of days later I got a phone call from, what I now refer to as "my guardian angel," Teri Biga. She introduced herself and I immediately knew she was very knowledgeable about what she was doing, as well as, patient and caring. From that moment on, I was treated that way by everyone in the organization. I asked for referrals and they were immediately sent to me, along with all the information about the costs. I was blown away by the difference in cost of this versus what it did it America. But Mexico? Because of the bad stories in the media whether or not this was a smart move or not. Never having been a quitter, I called the people on the referral list one at a time and over and over it was the same answer "it really is all they say it is, and I would go do it again tomorrow." So armed with all this new information, I decided I was all in. I called Teri and told her that I wanted to schedule my surgery and from that moment on it was all about me. The service was absolutely personal and professional from that point forward, outstanding, the best. In June 2011, my wife and I headed west to begin our adventure and we were off to Juarez, Mexico at the Star Medica Hospital. We were met by smiles and one of the cleanest hospitals I've ever seen. We were immediately checked in and shown to our room which was very nice and once again extremely clean. I was then given the pre-ops, which was very professionally done by some of the nicest nurses I've ever known. Then the Doctors all came in and we talked about the procedure and they answered all my questions, in perfect English. There are no words to describe how much I like Dr. Jose Rodriguez. He is the kind of person you have to meet to truly appreciate. He genuinely cares about you as a patient and a person, his bedside manner is second to none, not to mention an excellent surgeon. He was awesome. When I woke up in recovery they continued to monitor me constantly and then I was taken back to my room. The care I received for the next 3 days was amazing, I never had to wait for anything. All medications were given on time and every time we needed something, it was seen to immediately, again with a smile. It has been 8 weeks since my surgery and I have never felt better. I have lost 52 lbs. and 2 sizes in pants. * I no longer have to take blood pressure or cholesterol medications and I can walk 2 miles a day which would have been impossible before surgery. * I have probably taken the long way around in telling my story, but I feel it is very important for anyone trying to decide on having this surgery done to have as much information as possible to help put their mind at ease. The surgery itself is only a tool and you still have to put in the work, but it is by far the best thing I have ever done for me and my family. I'd like to assure anyone out there that may be hesitant, that you will not be sorry you had this done. A positive attitude will help you more than anything else and it is what you get when you call BeLiteWeight. They will stay with you every step of the way. I could not be more pleased with my experience with all involved.